Well a few days ago I posted about my “Smashbooks” find and lo and behold I discovered a similar product out there (with a better name, I might add). Stampin’ Up! has a new product out called “This and That”. Love it! Here’s the fun part. Until the end of April you can get a whole bundle of This and That products (themed “Epic Day”) to start smashing things into your book right away. Hurry! The bundle is only available through April 30 and makes the set 15% off the price of all the things individually! Go go go! Personally I can’t wait to get the “Remember This and That Rotary Stamp” – what a great idea! So… I guess it’s time. 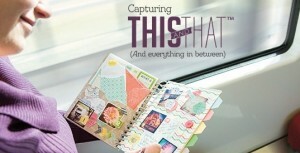 I’m going back to the original kind of scrapbooking and I can’t wait! Wanna join me? “Smash Books” – Everything old is new again! So today I had to run to Joann crafts to get some thread and twill tape for my daughter who is making gorgeous colonial outfits for our trip to Williamsburg next month. I had a little extra time so I strolled the aisles and stumbled on a kiosk for “Smash Books” – a new kind of scrapbooking. Or is it? I had heard about the concept. In my own words, just take all the stuff you want to save but really probably should maybe throw away because you know it’s going to end up in some drawer somewhere and either get ruined or thrown away later but you really don’t want to throw it away because it kind of has a memory or something tied to it so you keep it but now you need some place to put it so you put it in a scrapbook. So…wait a minute? That’s just old fashioned scrapbooking, right? Well, yeah, but someone creative at K&Company came up with a fun way to market an old craft and it looks like they’re making a bundle. I have to admit, though, that the way they’ve packaged this is really clever and handy. The book itself is a nice size and it’s already full of backgrounds and prompts so there’s not the looming white page of death staring at you waiting for you to make it look fabulous. In fact, on some of the pages you really can just jot a few notes and it’ll still look good. Attached to the book is a loop for the pen/gluestick combo that I think is really smart. One side has a marker with a .45 tip and the other side is a thin glue stick, so you’ll always have it with you in case you want to glue in a receipt, special note or something you found in passing. Very cool. I didn’t purchase any accessories. Since I’m a Stampin’ Up! demonstrator, I have all the little extra stuff I need to make my book my own, but they’ve got a lot of cute stuff that you can add in to your books. I did a quick review video below while I was in the car opening up the package. Enjoy! And do you Smash Book? Let me know what you think! On a sidenote, I asked on Facebook if anyone in my network ever smash booked. One of my friends said that the “smash booking” of her day was when popular girls in the click would take a sheet of paper and write nasty things about another girl and pass it around to each other. So mean! Maybe the company should have thought of another name for their product? When you think of children’s birthday parties, you may get images of disposable tablecloths, plastic favors, paper plates and cups, and balloons. These fun events can be extremely wasteful. But children are often just as happy with home-made favors and reusable tablecloths. They just like time to play and eat cake! So let’s take a look at low-impact birthday party ideas that are big on fun and low on waste. Here is where you can get really creative. Children enjoy handmade decorations, both making and looking at them. Here are some ideas. * Instead of rubber balloons, try setting up stations of eco-friendly bubble solution and large, reusable bubble wands. You can also get paper balloons that are more eco-friendly than rubber. * Instead of plastic confetti, use a hole-punching tool on old magazines to make colorful circles and other shapes. * Use flower blossoms, petals, or colorful leaves you gather yourself instead of confetti. * Make flower chains, or recycle old magazines to make colorful paper chains. * Use an old sheet for the tablecloth, and let the party guests decorate it with fabric paint or markers. It will then be a keepsake. * Instead of plastic or paper cups, plates and flatware, use washable ones. Again, creativity can go a long way in “covering” for your money saving – for example, have a car wash theme and serve your punch from a bucket (clean and food grade, of course), or serve drinks from a hanging pot (cauldron-style) for a Halloween theme. Remember that children really love to play and run around. Adults tend to think that every unscheduled minute is a wasted minute, but your low-impact party will be remembered as one of the most fun ones ever if you hold it at a playground, park, or other place where kids can be kids. * Go for a green theme. Let children plant garden plants, flowers, or trees for a seasonal birthday memory. If weather permits, hold the birthday party outdoors in a local park or state forest. * Games do not need to involve paper, plastic, or other disposable items to be fun. Scavenger hunts (try a nature theme), tag, relay races, and other “old fashioned” games are perfect for a low-impact party. * Host a “come as you are” party. This party theme does not involve paper invitations, making it even more eco-friendly. Each guest gets notified electronically or by phone at random times of the day, and whatever the prospective party guest is doing or wearing at that moment is how he or she must come to the party. For example, if you call one of your guests at 9am and he is wearing pajamas, he wears those pajamas to the party. If the prospective guest is out walking her dog when you call, she must bring her dog and wear her walking clothes to the party. This is a really fun theme that can get everyone laughing. * Favors can be home-made baked goods, potted seedlings or seed packets, or something children will treasure long term, like polished stones. There are so many ways to celebrate birthdays without spending a lot of money or being wasteful. Children’s parties are often associated with waste, and for good reason. Between paper plates and cups, plastic flatware, party hats, and favors, a child’s party can turn into a very wasteful event. If you’d like to host an eco-friendly kids’ party, here are some ideas. 1. Hand-make invitations (with your child’s input) on recycled paper. Or send electronic invitations. 2. Bake a healthier birthday cake using whole wheat pastry flour and honey or other natural sweeteners. Instead of a cake, you could bake healthy cookies or muffins disguised as cupcakes. Arrange them in an interesting, dramatic display (cupcakes can be stacked in tiers, cookies can be put on skewers to mimic flowers, etc.). 3. Serve iced herbal tea and water instead of artificially colored, sugary drinks. Brew up some fruit-flavored herbal tea, such as raspberry, and sweeten it with stevia or natural sugar. Iced spearmint or peppermint teas are also favorites with children, as is homemade lemonade and punch. 4. Ask for recycled or used gifts. Request that your guests shop at local antique, Goodwill or second-hand stores for your child’s birthday present, or even in their own attic or basement. 5. Request that gifts be wrapped in reusable totes, cloth, or newspaper. 6. Use reusable tableware and tablecloths, or go with those made from recycled materials. You can also rent party supplies that are reusable. 7. Favors do not have to be plastic trinkets in plastic bags. Use brown lunch bags, for example, decorated with stickers, markers, stamps, etc. 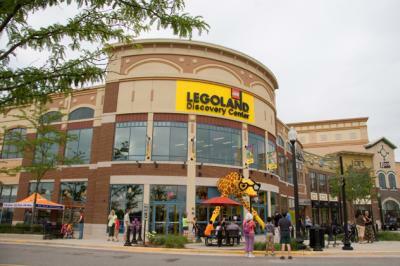 Fill the goody bags with eco-friendly (or homemade) candy or cookies, art supplies, homemade play-dough, wooden toys, etc. 8. Party guests can plant a tree in the birthday child’s honor. 9. If it’s evening, have a campfire and stargazing. Daytime parties can involve a local park or playground followed by a nature walk. Camping out in tents overnight is another fun (and green) party idea for older kids. If weather does not permit, “camping” in tents in the basement or living room can be just as fun, and stargazing through windows works fine. Your child’s birthday party does not have to be expensive or wasteful. Baking Soda, also known as sodium bicarbonate, has an amazing array of uses for natural beauty care. It is inexpensive and can be purchased just about anywhere. So it’s worthwhile to know some of its applications beyond helping to make delicious chocolate chip cookies! Did you know that baking soda and water alone make an excellent shampoo? It helps remove build-up caused by hard water or styling products. 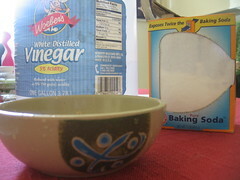 Mix about 1 teaspoon of baking soda to one cup of warm water. Add a drop of essential oil (click here for essential oils) if you like. Pour over your head, work with your fingertips, and then rinse well. There is no need for conditioner; the baking soda mixes with your hair oil to make a gentle, conditioning soap. If you don’t have time to wash, just sprinkle dry baking soda onto your hair and brush it through. Or, put it on your comb or brush and work it through your hair, taking care to get it down to your scalp. It actually mixes with your hair oil to form a cleanser, which gives the impression that it is “absorbing” the oil. You don’t need expensive exfoliants to give your skin a healthy glow. If you have thick, dry skin on your heels, knees, or elbows, mix baking soda with water in a 3-to-1 ratio to make a thick paste. Rub this paste into the dry skin areas after your bath (when the skin is softened). After rubbing it in thoroughly, rinse well and apply a moisturizing lotion. Baking soda helps slough off calluses and tough, dry skin. 4. Purchase baking soda tooth products and powders when you click here.